Property Info: 2 Bedroom, 2 Bath unit with 1,200+/- sq. 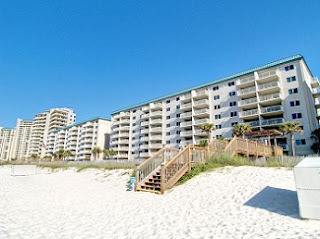 ft.
Sandy Key gulf-front condo for sale in Perdido Key. Fabulous beachfront residence located off the main beach road with a gated entrance, temporary boat/trailer parking, tennis courts, fitness center, BBQ grills, gated access to the beach with shower, assigned storage closet. This condominium home is being sold totally furnished. New HVAC system installed 1 year ago. 4th floor view means you and your guest, have exceptional views of the Gulf of Mexico from inside the condo. Don’t pass this by, come see this resort property today!